A popular strategy for building and planning your online course is creating a membership website for students. This can be done in conjunction with a learning management system that could house your course content, or as an alternative means of growing your membership base, interacting with your members and providing them new material. Membership sites are a really great strategy for building community and a great tool if you plan on having ongoing content. 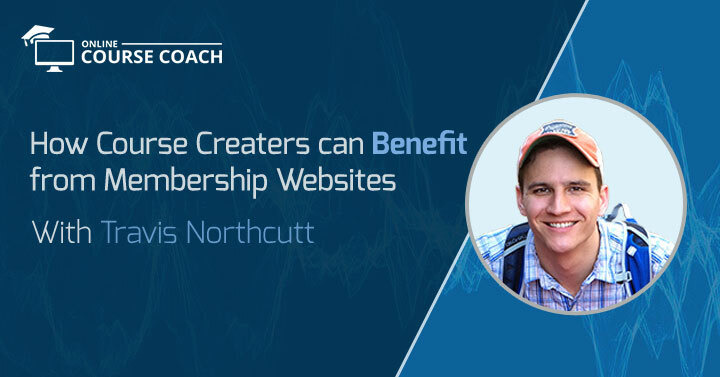 In this episode I spoke with Travis Northcutt of Member Up about the pros of using a membership site and what you should keep in mind if you plan on using one for your online course. Travis runs Member Up, where he helps membership sites reduce churn and grow their business. He sends out daily tips on running a membership site to his email list. What is a Membership Site and Why Should You Consider One? It’s just a label and a lot of the time the lines are blurry. A membership site has a subscription component, with ongoing payments. Usually it’s an open ended relationship, where you can be a member for a set amount of time. A helpful aspect of many membership sites is the community component you get with discussion forums or Facebook groups and the like. Membership sites are particularly great if you have continuous content and not just a set course that needs to be housed and easily accessed. A membership site will generally have content that is available every month. Whether it is new content like webinars, or private Facebook groups, it is ongoing content. If you would like to engage directly or have a more personal relationship with your members. Membership sites often have discussion forums and other types of community engagement. Forums can be used to market a membership site or to help with optimization through constant user feedback. When Should You Have a Community Forum or Community Aspect? If you have the capacity to devote time and resources to it. If you need to nurture your community. If you need help building loyalty and commitment. If you would like feedback on how to improve your content. The core of most membership sites is the learning and training, so your content needs to be strong and regularly updated. However you do it, you need people to feel like they are getting value for their money. Your members should tot have to navigate a complicated site that needs them to be to prescriptively guided so they lose autonomy. Nor should it be too easily digested and then not beefed up with continuous opportunities to learn and develop. Have an audience already. While you are creating the content for your online course also be building your audience. You don’t want be in the situation where you launch a membership site and then have to climb a mountain in order to create an audience to consume all the information you have spent hours compiling. You need people who have trust in and value your platform. Study how other people connect with their audiences. Churn reduction: Travis believes that one of the biggest opportunities for churn reduction is tracking member engagement over time. This allows you to know when member engagement dips so you can do something to reactivate members who may be at risk of churning. Upsells: You may find that on your site you have so called Super Members. These are the members who engage heavily, consuming all your content, writing regularly on forums etc. It is important to have something more to sell to these members, who are eager and committed. This could be one-on-one coaching, a private mastermind, personal invites to live events, or converting Super Members to an annual plan. Not every community is huge. There are many niche communities that are perfect for membership sites to tap into. These are opportunities for you to have a site that may cater for a small group of people within a narrow field of expertise. You could create a membership site for communities that may never have been brought together were it not for the forums on your membership site for example. A huge benefit of membership sites, especially if you are selling to corporate customers is that you can sell group access. This allows a single client to buy your content and make it available to an entire office or workspace.This means that you can capitalize on the amount of revenue you can gain from a single member. You could also create a membership site for a single company or branch of a company that allows you to create content for the needs of industry specific clients in a personalised manner that has value for you and value for your client. The point here is that with membership sites your options are not necessarily endless but they certainly become more prevalent. The opportunities a membership site can provide are limited only by what you can imagine and the knowledge you have to provide. There is no need to become overwhelmed by needing to create content. Start with a strategy for creating ongoing content for paying members such as a content calendar. If you need to be creating ongoing content then a consistent steady drip is probably the best way. Be dependable. Keep having something for people to look forward to. This will help with engagement and again aid in reducing churn. Don’t worry too much about how you are going to keep creating content in the long run. Focus on keeping the content up to date and consistently available now. Further, it is important that you have a good library of content before you start your membership site to allow you breathing room and to ensure that the content does not dry up early on. Most people will try and direct traffic to their signup page in order to get someone to join their membership site. This is simply another type of cold calling that banks on peoples’ immediate engagement. A better strategy for sales funneling is to direct people to a landing page instead and get them onto an emailing list first. This gives you more than one chance to sell to them. An emailing list also gives you a good sense of who it is you are trying to sell to. Rather than having a potential client land on your signup/sales page, bounce away, and never be heard from again, an email list allows you the opportunity for personalized feedback and engagement with a definable individual. Along with Facebook Adverts, another avenue for marketing is webinars. Weekly live webinars can be an excellent way to capture signups and engage with a whole new audience. Although this can be a time consuming endeavor, the potential increase in revenue may make the arduous task worth it in the end. If you are looking for an effective way to get ongoing content out to a dedicated audience that you would like to grow then a you should definitely consider a membership site. Membership sites allow you to create community spaces, create new opportunities for your online course, and ultimately grow your revenue. Visit memberup.co/online/course for book discounts for listeners to The Online Course Coach Podcast and use coupon code “Memberzen”. Watch the Online Course Quick Tip Videos here.